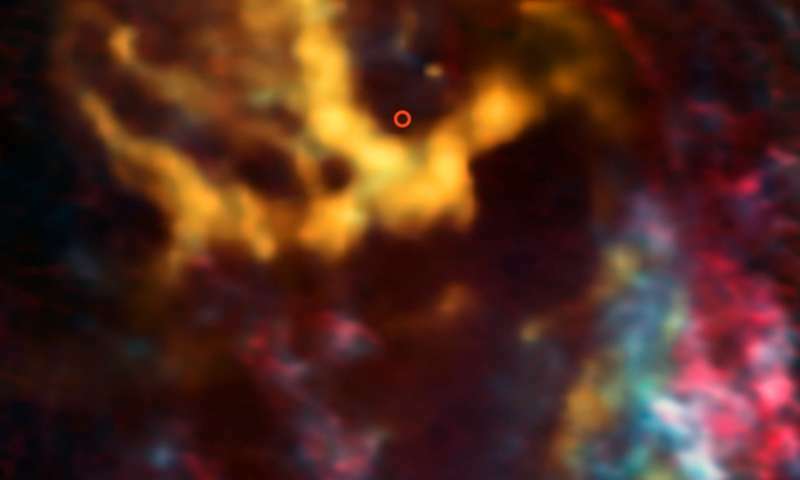 This image from the Atacama Large Millimeter/submillimeter Array (ALMA) shows the area surrounding Sagittarius A*, the supermassive black hole that lurks at the centre of the Milky Way—highlighted here with a small circle. New research has revealed exciting evidence of interstellar gas and dust orbiting the black hole at high speeds. The molecular-hydrogen-rich gas clouds which have been identified are known as molecular cloudlets, and they have never before been unambiguously detected. This image actually shows the distribution of molecules including carbon monoxide, the cloudlets' second most abundant molecular component. The cloudlets lie 26 000 light-years away from us, orbiting fast and relatively close to the black hole, at a distance of about one light year. ALMA's high resolution allowed scientists to detect the cloudlets, which are the products of pre-existing massive clouds rotating around the centre of our galaxy. These clouds were tidally disrupted into dense fragments and a lower density, short-lived component. The latter was identified thanks to the signs left by the passage of the synchrotron radiation emitted by Sagittarius A* through diffuse gas between the cloudlets. While the stars orbiting Sagittarius A* have been systematically observed, these dense molecular cloudlets have not been detected so close to the centre of our galaxy before. Yeah, to sports aficionados it's called SHADOW BOXING, everybody knows "silhouette" is about the same thing. There's Benni, on a BH article like a fly on a turd! Benni, does not get relativity, therefore he cannot comprehend BHs (never mind the BB). Yet he is a great fan of Einstein's. How is that possible you ask? It's because Benni is in denial. He knows he is incapable of comprehending the concepts, so he makes them up for himself in a way that apparently makes sense to him (but to no one else except a few insane posters here). This is easily demonstrated by reading his comments, spotting the BS and then asking him to please come over to the forum here at "http://www.physicsforums.com"" title="http://http://www.physicsforums.com"" rel="nofollow" target="_blank">www.physicsforums.com" and explain them in a format much better suited to discussion. He is terrified of that, you should see him squirm. So Benni, want to come over and discuss your idiocy at http://www.physicsforums.com ? I thought I was the one suppose to be making up new words to match evolving concepts! Well the wooist cultist such as benni, have already stolen my thundermug description of their bumkum and claptripping over their own ignorance. If I can just get in early on these articles, I might be able to scare Benni away from more of them, use his phobia of forums against him.